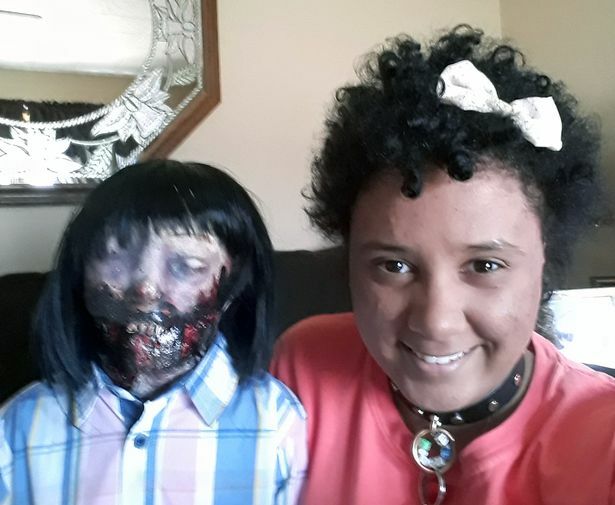 A girl who married her zombie doll says her ‘world is now complete’ after their nupitals. Felicity Kadlec, 20, wed the ‘love of her life’ Kelly Rossi, a zombie doll who she claims is 37-years-old, in front of her other dolls. The ‘beautiful’ ceremony, which took place in Tiverton, Rhode Island, USA, cost Felicity $500 (£388) – covering her own wedding dress, a suit for Kelly and decorations for the outdoor venue. Alongside four of her family friends, eight of Felicity’s other dolls also attended the ceremony to show their support in the ceremony six months ago. Felicity, who now lives in Vinita, Oklahoma, claims that marrying Kelly has made her feel closer and more intimate with her. Felicity said: “Our wedding ceremony was beautiful and perfect – exactly the way I dreamed it would have been. She said: “I found Kelly on a creepy doll collection website and my dad bought her for me when I was 13. “It wasn’t until I was 16 years old that I started to get feelings for her, but it was something that I kept on trying to deny. “When my father died last year, I found myself becoming closer and finding comfort in Kelly, as she was someone that he had bought for me. “I finally allowed myself to be open with who I was and let my feelings come out and, despite not everyone agreeing with my love life, I have never felt happier. Despite Kelly’s zombie-like appearance, Felicity claims that she loves her doll deeply and wouldn’t change her for the world. She said: “I married Kelly but only because I accept her for who she is, I look past her bloody face and I don’t mind her not having a jaw. “Also her spirit and personality traits made me know that she was the one for me and that I wanted to spend the rest of my life with her. “To me, she is perfect, and I can feel that she loves me very deeply and I can sense her happiness since we have married. “Just seeing her at the alter when I walked down the aisle was amazing, and to me she looked beautiful.